Monument Beach is a man-made beachside park in New New York that boasts a collection of many of the world's greatest monuments. The collection was stolen by an evil supervillan who was elected Governor of New New York who also added his own face to the end of Mount Rushmore. The Professional Beach Bully works on this beach. The monuments on the beach were destroyed when the Omicronians attacked. According to a deleted scene from DVD Volume One, Monument Beach is a man-made beach because no one could swim in the real ocean because it had too many whales. Farnsworth explained that, after humans had stopped hunting them, their numbers swelled, as did their appetite for human flesh. The White House is seen on Monument Beach, however it appears in Washington D.C. in later episodes. The Leaning Tower of Pisa is seen on Monument Beach however it later appears in "The Cryonic Woman". 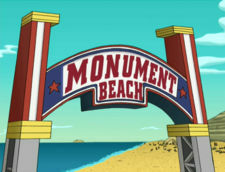 The two episodes in which Monument Beach appears were written by the same person.